I sold a new round of calls this morning on WFR. As I mentioned in an earlier post I was looking to sell either the JAN $12.5s or the FEB $14s depending on which direction WFR decided to take. Well, over the past couple of days the direction has been up. Thus, this morning I sold the FEB $14 calls for $0.80. Some of you might be curious as to why I chose the FEB $14s instead of the JAN $14s. My regular readers know I usually sell the near month calls and puts. With WFR right now, that strategy just didn’t make sense. The JAN $14s were only selling for $0.30-0.35. Meanwhile the FEB $14s were at $0.75-0.85. Usually calls and puts with a strike price two months out trade at a multiple of less than double the price of the near month options. That clearly isn’t the case with WFR right now. I suspect traders believe WFR is going to continue trending higher but that they don’t have much faith that it will get above $14 by January expiration. However, they are much more confident this will occur by February expiration, thus they are willing to pay a premium price for those options. Below is a log of my WFR transactions. As you can see my cost (net of commissions) is now down to $11.80. If assigned at $14 in February my ROIC will be better than 17% in just 9 weeks. Not bad. If unassigned my ROIC will be around 8%. I saw your comment about not getting anything back on your Scout search. Wanted to show you my Scout search criteria and the results. However, I can’t post images in comments so I had to post a new message. Below is an image of my Scout search criteria. You’ll notice it is not very restrictive. I modified the criteria earlier this year because, like you, I wasn’t finding any reasonable candidates for investment. I intend to re-tighten the criteria when the market starts going wacky on us again. 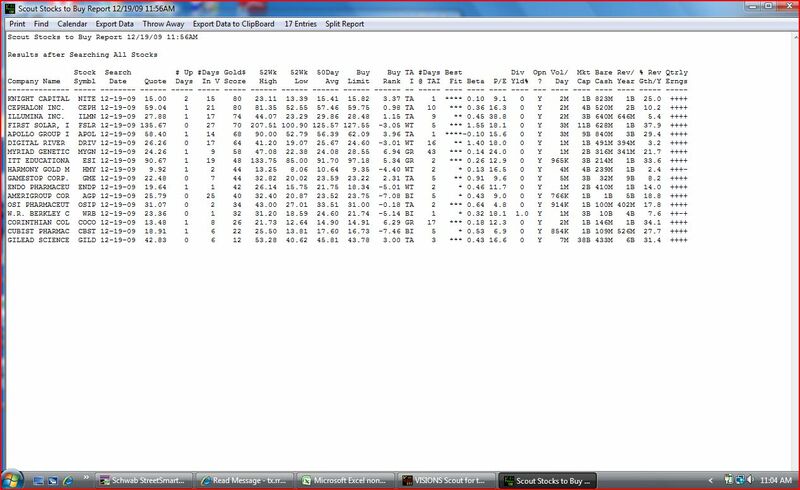 Below is an image of the results file I got back after running Scout on 12/19. Gamestop (GME) – Bought 200 shares at $22.65. Sold two JAN $22.50 calls at $0.96. This makes my break-even point $21.69. If assigned at expiration my return will be 3.58%. If unassigned it will be 4.27%. Knight Capital (NITE) – Bought 300 shares at $15.17. Sold three JAN $15.00 calls at $0.65. This makes my break-even point $14.52. If assigned at expiration my return will be 3.16%. If unassigned it will be 4.33%. Also wanted to give everyone a quick update on MEMC Electronic Materials (WFR). You’ll recall I executed a buy/write on it last week. I bought 500 shares at $12.77 and sold the DEC $13.00 for $0.22. These calls expired OTM. My original plan for this month was to sell the JAN $12.50 calls. However, a fellow trader and friend (thanks Ed!) persuaded me to wait as he believes it is going to continue moving higher. 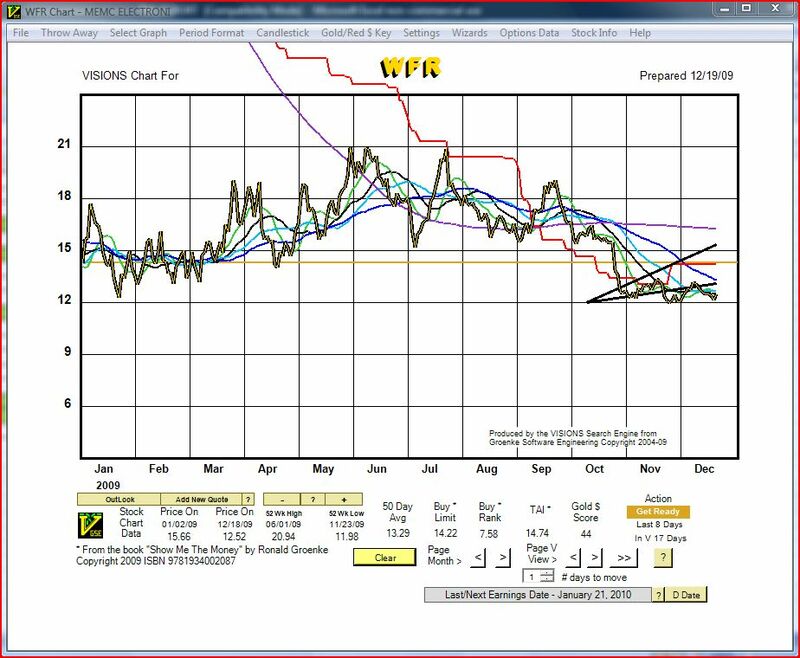 Thus, my plan now is to sell either the JAN or FEB $14 calls if WFR moves higher. If it stalls out I will sell the JAN $12.50 and capture some ITM premium. Can You Believe It – Choices! Yes, it is true. For the first time in months I feel like I have multiple stocks from which to pick my next trade. As all of my regular readers know I haven’t been trading much of late. Quite simply, I couldn’t find stocks that both met my VISIONS criteria AND had what I considered to be an acceptable risk/return ratio. GameStop operates as a retailer of video game products and personal computer (PC) entertainment software. It sells new and used video game hardware; video game software; video game accessories, including controllers, memory cards, and other add-ons; PC entertainment software; and strategy guides and trading cards. The company sells its products through its 6200+ stores, as well as through an electronic commerce Website gamestop.com. This is the second time I have considered a trade in GME. Earlier this year (July/August) I executed a very successful CC and NP trade on GME. Illumina, Inc. engages in the development, manufacture, and marketing of integrated systems for the analysis of genetic variation and biological function. It also is a stock I’ve traded previously. 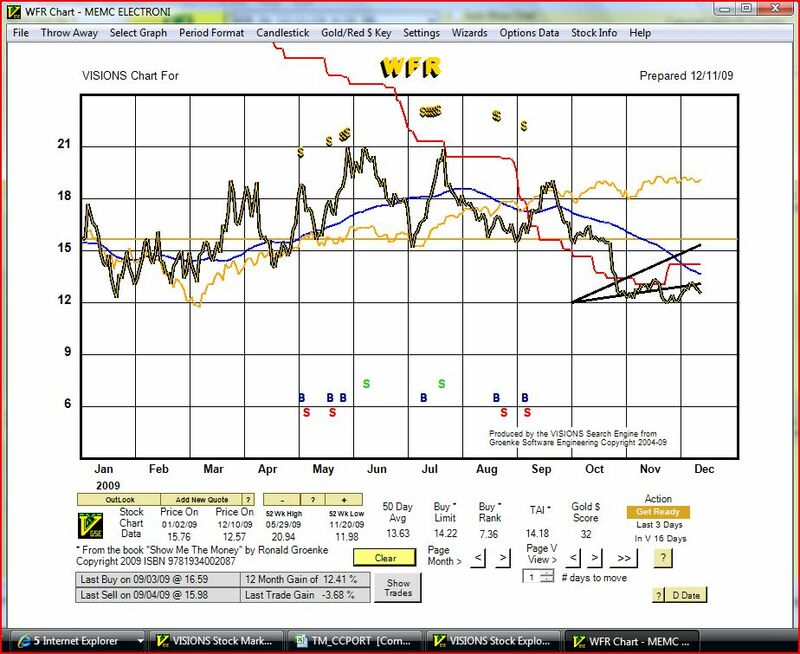 However, in this case it was a trade I entered before I began using Ron’s VISIONS methodology and software. Knight Capital Group, Inc., a financial services company, provides electronic and voice access to the capital markets across multiple asset classes for buy-side, sell-side, and corporate clients; and asset management for institutions and private clients in the United States. It operates in two segments, Global Markets and Asset Management. And last, but not least there is MEMC Electronics. MEMC Electronic Materials, Inc. designs, manufactures, and sells silicon wafers for the semiconductor industry worldwide. Its products include prime polished wafers, such as OPTIA and annealed products; epitaxial wafers consisting of thin silicon layer grown on the polished surface of the wafer; test/monitor wafers for testing semiconductor fabrication lines and processes; and silicon-on-insulator wafers used for the chip making process. The company’s products are used in the manufacture of various semiconductor devices, including microprocessor, memory, logic, and power devices, as well as the starting material for solar cells. As you know I entered a trade in MEMC just a week or so ago. My December calls expired worthless so I hopefully will be selling a second round of calls on it this coming week. I am including it again in this analysis because I feel it is still at a good entry point for folks who didn’t join me in the trade last week. 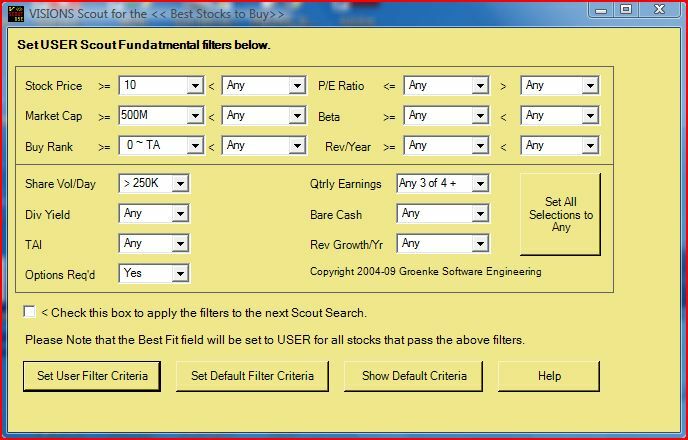 Below is a spreadsheet showing the key metrics for each of the stocks under consideration. Cells shaded in green are the best value among the four stocks for that particular metric. As you can see NITE is the clear choice based simply on having the best metrics in 5 categories. At 92, it has the best Gold$ score. It also trades at closest to it’s book value, has an exceptional amount of net cash on its books, and has the best TAI score. However, let’s not make a hasty decision. Let’s have a look at the stock charts. In my opinion, of the four stocks under consideration, ILMN has the best looking chart. 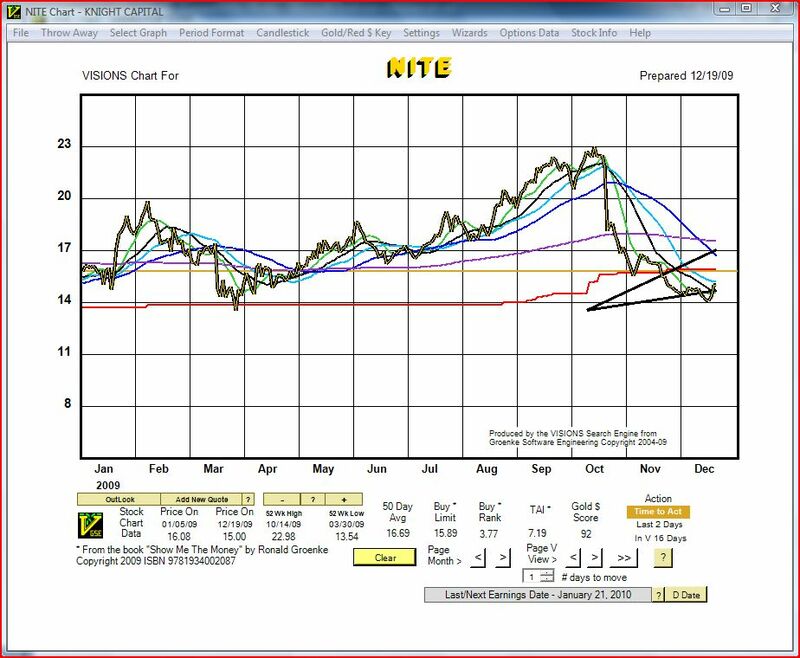 After selling off sharply late in October it has since stabilized and is now trending back up right in the middle of the V.
OK, now let’s see what our ATM call options look like. Below is a list of the near month ATM options for each of the four stocks being considered. None jump out at me as being far superior to the others. The disadvantage with the ILMN stock price is that it is right in the middle between the next available strike prices. The other three stocks all trade at or within mere pennies of the ATM strike price. Thus, with ILMN you have to make a decision as to whether to write the ITM or OTM call. WFR offers the best uncalled and second best called return, followed by GME. 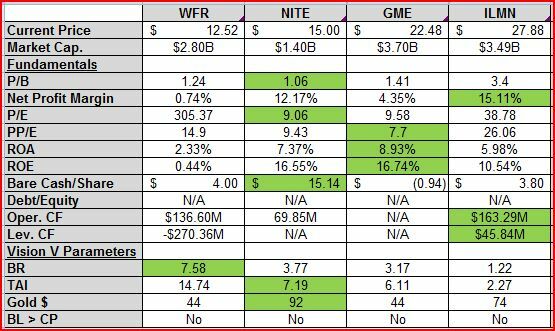 NITE offers the least return but is by far the safest pick with the huge pile of net cash sitting on its balance sheet. What to do, what to do? For me, it comes down to choosing either GME or NITE. Why? Well, I already have a position in WFR that I need to sell a second round of calls on so I don’t want to pick it and end up with too large a position in one company. 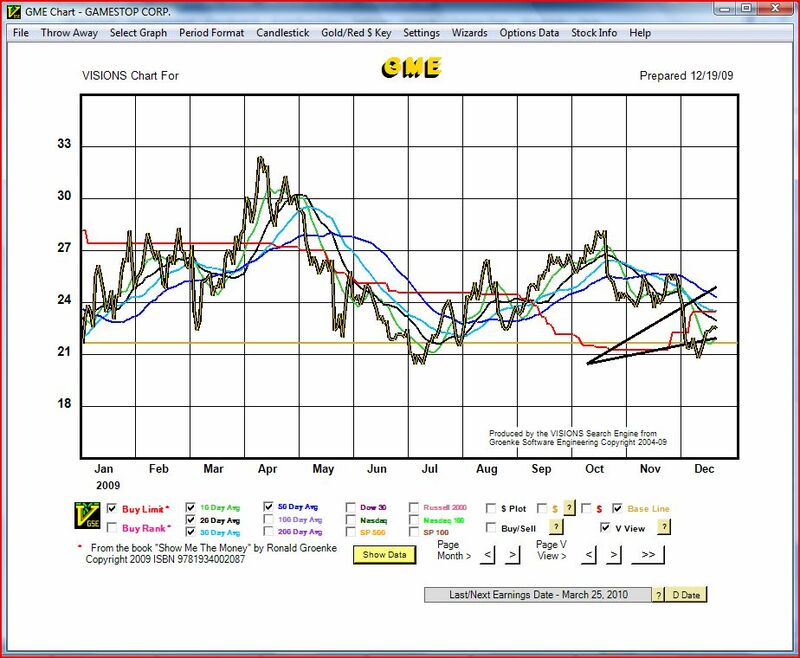 With GME I get a company I’m very familiar with and which I have successfully traded before. With NITE I get a company selling for less than its net cash. In this market, that ‘safety net’ is very appealing. 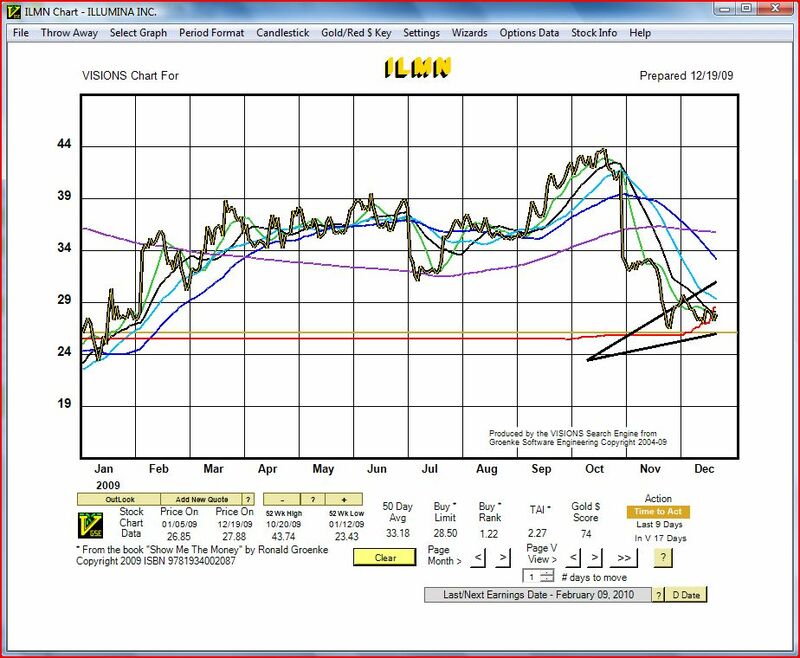 While I like ILMN’s chart I don’t like its fundamentals. It sells for over 28 times earnings and almost 3.5 times book value. I also don’t like having to choose between the ITM or OTM call. So what am I going to do? Well, I’m going to wait and see what Monday brings. Its a toss-up right now between GME and NITE. Perhaps the market will make the decision for me on Monday with one or the other moving sharply one way or the other. What do you think? Reply to this post and let me know which one you like and why. Tell Congress to Block the Trader’s Tax! This is the first, and I assure you, will be a very rare political post. I am a private person and I generally do not like to voice my political views in a public forum. However, the situation I want to bring to your attention today could affect all of my reader’s in a significant way. Thus, I felt compelled to publish this information on my blog. Back in February, U.S. Congressman Peter DeFazio introduced bill HR 1068, “Let Wall Street Pay for Wall Street’s Bailout Act of 2009.” The proposed legislation imposes a 0.25% tax on all stock, bond, and option transactions. So, for example, anyone with the audacity to buy and sell 100 shares of Apple would pay about $50 in taxes for the round trip. If passed this bill would make it virtually impossible for small trader’s like you and me to earn a fair return relative to the risk being taken in a position. Thus, while I personally feel it has little chance for becoming law (hopefully saner minds will prevail), I do think it is important to get the word out and ensure your voice on this issue is heard in Washington. Below please find a link to a site which will allow you to automatically send emails to your elected representatives. Read the information and decide for yourself. Note, if you decide to participate you are given two options snail-mail letter or emails. The snail-mail option requires a payment of $9. I chose not to do this and elected to just send emails. One final note, I am in no way affiliated with the web-site conducting this campaign. Nor do the views expressed there necessarily correspond to my own. I just want to pass along the opportunity for you to have your voice heard. I executed a new CC trade today in MEMC Electronic Materials, Inc. (ticker symbol: WFR). MEMC designs, manufactures, and sells silicon wafers for the semiconductor industry worldwide. Its customers comprise semiconductor device manufacturers, including the memory, microprocessor, and applications specific integrated circuit manufacturers, foundries, and solar cell and module manufacturers. It was founded in 1984 and has annual revenues of around $1.23B. Thus, my net cost and break-even point is $12.55. Uncalled ROIC: 1.72% with only 8 days remaining to expiration. Annualized this equates to an ROI of 78.60%. Called ROIC: 3.52%, 160.77% annualized. If you’ve skipped ahead and looked at the chart and the KPIs you undoubtedly are wondering why I did this trade. At first glance it doesn’t seem to have much positive going for it. The stock is trading below the Vision V and it has a very low Gold Score. Mr. Groenke would probably groan and shake his head if he saw this trade. So, why did I go ahead and do it? Well, primarily for two reasons, one fundamental and the other technical. First, the fundamental reason is the strong balance sheet. WFR is sitting on almost $1B in cash and very little debt (< $30M). Thus, if I’m wrong about the trade I don’t have to worry about the company going bankrupt on me. Second, the technical reason is the proximity of the stock price to its 52-wk low and a strong support level ($12.00). I have been watching WFR for several weeks now. It has strong support at $12. Multiple times it has fallen to around $12 and bounced back. Thus, again if I’m wrong about the trade I can take comfort in knowing I’m buying in at a good price and need not worry about it falling a great deal further. As I mentioned earlier I have been following WFR for several weeks. My original intent was to sell naked puts at $12 as WFR bounced off support at that price. However, everytime the set-up for the NPs looked good I couldn’t pull the trigger or was busy and missed the opportunity. However, after logging in today and looking at the returns I could generate for an 8-day holding period, I decided to change my tactics and sell the $13 CCs instead. So, what’s my plan? Well, if uncalled, depending upon the price of the stock, I intend to sell the JAN $12.50 calls which are currently trading around $0.75. If my DEC calls are ITM next Friday I intend to let myself be called away, take my 3.52%, and be happy. Best of luck to y’all in your trades as you close out 2009 and may you have a very prosperous 2010! Here’s your chance to brag or show off your stock picking skills.